A nice spring feeling with a new floral cami from SMS and new jeans from Sn@tch. 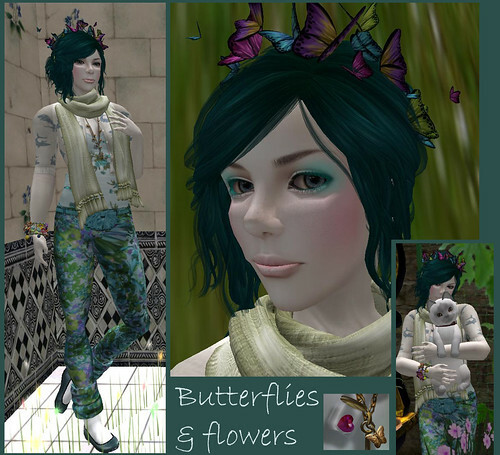 The butterfly crown is also new, at the Fantasy Fair: there are 2 animated butterflies, that gently flap their wings. The necklace from Yummy isn’t new, but very pretty, with little gold butterflies on a chain. Magika has a half price sale. 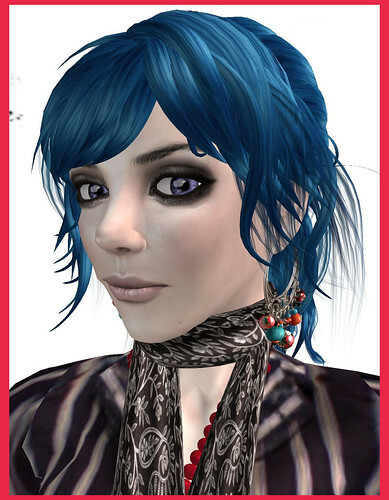 I ended up buying four hairstyles (I loved it that the demos were in my colours for a change) and this one is very cute, with a colour-change beanie and an attractive fringe of hair. 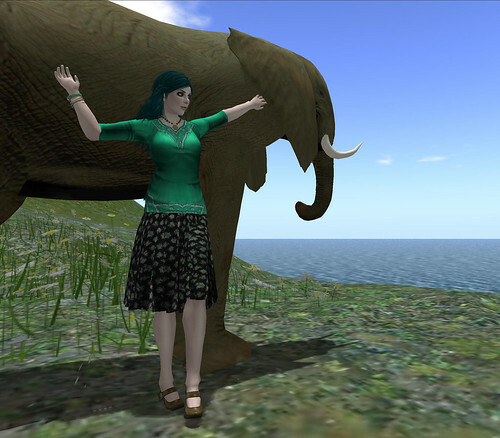 This elephant pose prop from Magnifique (99 Linden and it has 5 poses, and the elephant is just 9 or 10 prims) came just as I was lacking inspiration for how to show off the jade outfit I’d put together. I had something frothier in mind for jade, but when I rediscovered this silk top, I remembered how much I liked it. I also had to wear something more from the soon-to-go Eolande’s, these colour change jade bangles have been one of my staples. Picture taken in the Aju home shop. 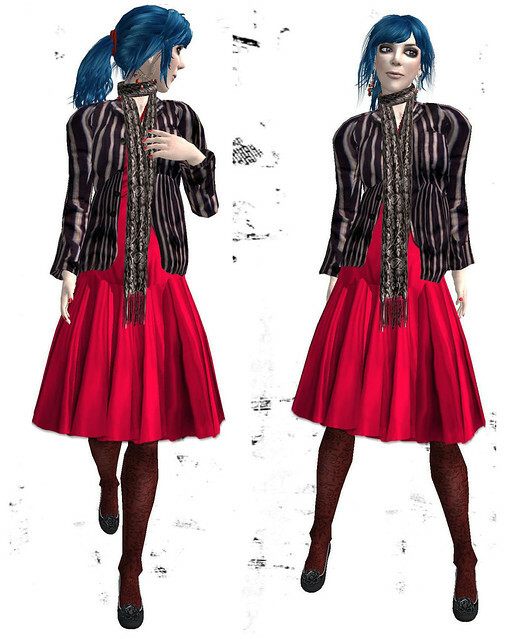 I thought I would blog my outfit for the Virtual worlds Best Practices in Education conference. I decided on smart casual, and it is a mixture of old favourites (the jacket and jeans) and new things (the shoes and necklace). These new shoes fall firmly into the “I want these in RL” category. I am pictured in the steampunk cafe at the conference (Steampunk is the theme of the 20-sim build). If you like steampunk it is worth a wander round: the cafe is here http://slurl.com/secondlife/VWBPE%20North%203/216/129/35/.